A traumatic brain injury (TBI) is any injury that affects the brain’s normal function. In nearly every instance, some type of blow whose impact is strong enough to shift the brain within a person’s skull causes the injury. The most common type of TBI is a concussion, which is diagnosed as mild, moderate or severe depending on the impact of the blow that caused the injury. If you have suffered a TBI, there are three things to know that will help in your recovery process. After suffering a TBI, you may find that your cognitive abilities are impacted by the trauma to your brain. This usually affects people who suffered a moderate or severe TBI that affects their thought process as well as their ability to concentrate or retain memories of new events. These cognitive issues may include difficulty speaking, speaking at a slower speed, and the inability to solve basic problems. Confusion is also common in the recovery process, and this is often made worse if you are exposed to loud noises. Because TBIs often affect the frontal lobe, which regulates behavior and emotion, you may find that you mood shifts without any reason, and that you become easily frustrated by your inability to resume basic tasks. These emotional shifts are also caused by the fact that you may not be able to go back to work and engage in social activity the way you did prior to the injury. But depending on the severity of your injury, it may take weeks, months or even years before you regain emotional stability. TBIs that affect the brain stem can cause physical problems, because this part of the brain regulates breathing, heart rate, swallowing, reflexes and your sense of balance. You may experience bouts of vertigo and be unable to keep your balance when walking or even when you are standing still, and you may find it more difficult to take consistent breaths. As information about TBIs has become more available, the public is also more aware of how it can affect long-term health. That’s why it’s so important for you to secure the services of a personal injury law firm after you suffer a TBI that was the result of the negligence of a third party. The Leifer Law Firm is an experienced personal injury attorney that serves Boca Raton, Fort Lauderdale and West Palm Beach. 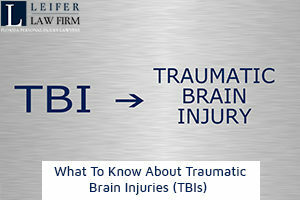 We have the expertise to help you with your TBI claim, and we know that the more information you have about TBIs, the better you will be able to understand our process. Contact us today to see how we can help you with your case.